iCloud is a web-based service from Apple that allows users to keep all sorts of data (music, contacts, calendar entries, and more) in sync across their compatible devices using a centralized iCloud account as the conduit for distributing the content. iCloud is the name of a collection of apps and services, not of a single function. All iCloud accounts have 5 GB of storage by default. Music, photos, apps, and books do not count against that 5 GB limit. Only Camera Roll (photos not included in Photo Stream), mail, documents, account info, settings, and app data count against the 5 GB cap. To use iCloud, users must have an iTunes Account and a compatible computer or iOS device. When data in iCloud-enabled apps is added or updated on compatible devices, the data is automatically uploaded to the user's iCloud account and then automatically downloaded to the user's other iCloud-enabled devices. In this way, iCloud is both a storage tool and a system to keep all your data in sync across multiple devices. Calendar entries and address book contacts are synced with the iCloud account and all enabled devices. Me.com email addresses (but not non-iCloud email accounts) are synced across devices. Since iCloud replaces Apple's previous MobileMe service, iCloud also offers a number of the web-based apps that MobileMe did. These include web versions of email, address book, and calendar programs that can be accessed through a web browser and will be up to date with any data backed up to iCloud. 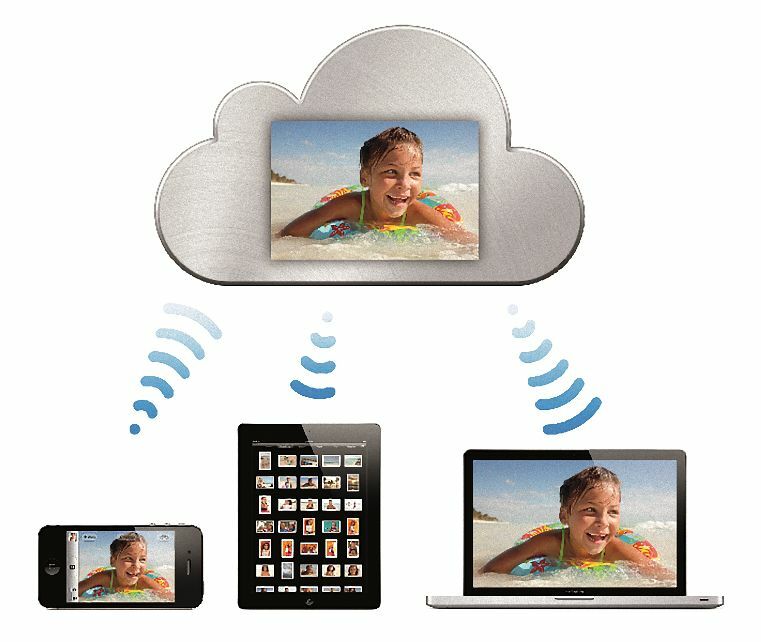 Using a feature called Photo Stream, photos taken on one device are automatically uploaded to iCloud and then pushed down to other devices. This feature works on Mac, PC, iOS, and the Apple TV. It stores the last 1,000 photos on your device and your iCloud account. Those photos stay on your device until they're deleted or replaced by new ones. The iCloud account retains the photos for only 30 days. With an iCloud account, when you create or edit documents in compatible apps, the document is automatically uploaded to iCloud and then sync to all devices also running those apps. Apple's Pages, Keynote, and Numbers apps include this feature now. Third-party developers will be able to add it to their apps. You can access these documents via the web-based iCloud account. On the web, you can only upload, download, and delete documents, not edit them. Apple is referring to this feature as Documents in the Cloud. Compatible devices will automatically backup music, iBooks, apps, settings, photos, and app data to iCloud over Wi-Fi every day when the backup feature is turned on. Other iCloud-enabled apps can store settings and other data in the user's iCloud account. When it comes to music, iCloud allows users to automatically sync newly purchased songs to their compatible devices. First, when you purchase music from the iTunes Store, it is downloaded onto the device you bought it on. When the download is complete, the song is then automatically synced to all of the other devices using the iTunes account via iCloud. Each device also shows a list of all songs purchased via that iTunes account in the past and allows the user to download them, free of charge, to their other devices by clicking a button. All songs are 256K AAC files. This feature supports up to 10 devices. Apple is referring to these features as iTunes in the Cloud. Just like with music, movies, and TV shows purchased on iTunes are stored in your iCloud account (not all video will be available; some companies have yet to strike deals with Apple to allow redownloading). You can redownload them to any iCloud-compatible device. Since iTunes and many Apple devices support the 1080p HD resolution (as of March 2012), movies redownloaded from iCloud are in the 1080p format, assuming you've set your preferences for that. This akin to the free upgrade to 256 kbps AAC that iTunes Match offers for matched or uploaded songs encoded at lower bit rates. One nice touch of the movies feature of iCloud is that iTunes Digital Copies, the iPhone- and iPad- compatible versions of movies that come with some DVD purchases, are recognized as iTunes movie purchases and added to iCloud accounts, too, even if you haven't bought the video at iTunes. As with other kinds of purchased files, iBooks books can be downloaded to all compatible devices without an extra fee. Using iCloud, iBooks files can also be bookmarked so you're reading from the same place in the book on all devices. You'll be able to see a list of all the apps you've purchased via the iTunes account being used with iCloud. Then, on other devices that don't have those apps installed, you'll be able to download those apps free of charge. Since iCloud can have a backup of all compatible files, users can easily download them to new devices as part of their set-up process. This includes apps and music but does not require an additional purchase. How Do I Turn on iCloud? You don't. iCloud features that are available are automatically enabled on your iOS devices. On Macs and Windows, there is some set up required. iTunes Match is an add-on service to iCloud that saves users time in uploading all their music to their iCloud accounts. While music purchased through the iTunes Store will automatically be included in iCloud, music ripped from CDs or purchased from other stores won't be. iTunes Match scans the user's computer for these other songs and, instead of uploading them to iCloud, simply add them to the user's account from Apple's database of songs. This will save the user substantial time in uploading their music. Apple's song database includes 18 million songs and will offer music in 256K AAC format. This service supports matching of up to 25,000 songs per account, not including iTunes purchases.